Buying distressed properties — are they a bargain?? 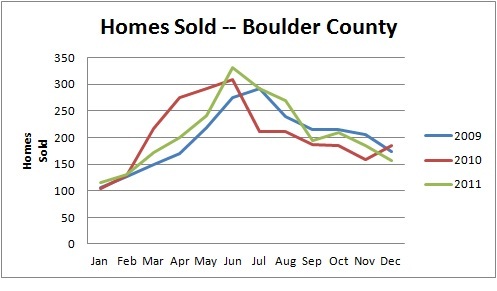 Even in the Boulder area, we are still seeing a lot of bank owned homes and sellers in distress. While we do not have the same numbers of distressed homes as Florida, Arizona, Las Vegas and other really hard hit areas, there are short sale homes and bank owned homes in our area. First, lets break the distressed properties into two groups — bank owned and owners in distress. The bank owned properties are pretty straight forward — the bank now owns the house either through a foreclosure process or the owner has “given” the house back to the bank through a “cash for keys” program or a deed in lieu of foreclosure. Bank owned homes are generally in “as-is” condition and may have had the utilities turned off. The banks generally do not have any information on the condition of the home or the systems in the home (plumbing, electrical, heating, etc) so there will be no disclosures. Buyers can inspect the home but may incur costs for turning on the utilities and getting them turned back off. The inspection may disclose big issues with the property and the bank MAY reduce the price but will generally not fix anything. The price a bank will take can really vary — the longer it sits on the market the lower the price may get but we have not seen banks selling a huge discounts below market value. Generally, the discounts have been indicative of the condition of the home compared to comparable properties. The good news is that banks generally act on offers pretty quickly and the process after that is usually smooth on the bank’s side. Distressed owners fall into two categories — those that owe less than the market value but are having trouble making payments and those that owe more than the house is worth (this is a short sale). If the owner is facing a short sale, the process can take several months and involves the owner’s lender approving the sale (there can be multiple lenders and that can extend the timeframe). If it’s a short sale, the property will generally be “as-is”. The lender (or lenders) will obtain an estimate of the market value of the home (sometimes called a BPO) as part of the process — they will use this estimate of market value to insure that the home is being sold for a fair price (not too much of a bargain). If the owner can payoff their loans, the process can be fast but the owner may not be in a position to make any repairs should any major defects be found. The basic rule in buying distressed property is buyer beware — the sellers of distressed properties will generally be “as-is” and may have a number of defects and deferred maintenance issues. If the price reasonable reflects the condition, there may be an opportunity for some “sweat equity” but the days of “fix and flips” are over and they don’t seem to be on the horizon — yet. If you have questions about bank owned homes or short sales, give me a call at 303-402-6000 or visit our website at www.bernardirealestate.com. 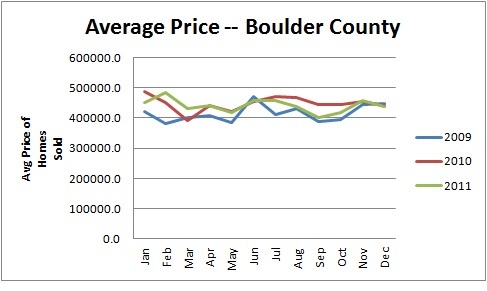 The Leeds School of Business recently released its assessment of the economic outlook for Boulder County. While there are areas of the economy that are still lagging, there are many areas showing some positive signs. The Boulder area has not suffered as much as many other areas because the local economy is stabilized by a world-class research university, several major federal laboratories, a well-educated workforce, a very favorable quality of life and a history of visionary entrepreneurs. The Boulder area has been an incubator for emerging industries in the past — technology, biotechnology, alternative energy, etc. Employment in the county has increased slightly faster than the population. The number of non-farm jobs increased 1.9% from September 2010 to September 2011 while the population has increased an average of .86% per year. The average wages in the county ($64,314) are higher than the state ($55,945) and national ($51,222) averages. The unemployment rate in the county is 5.9% compared to about 8.8% nationally. We continue to see some expansion in several different industries. The aerospace industry continues to be a bright spot in the economy several large employers, the federal labs and university all help create an atmosphere where start-ups can thrive. Biotechnology also benefits from a strong existing base of employers and will benefit from the completion of the new Biofrontiers Institute at CU. Other strong areas include information technology, natural and organic products, outdoor products and recreation and clean/renewable energy. There are also signs that venture capital is now flowing back into our area with a reported $96 million flowing in during the third quarter of 2011. Real estate is still limping along. Commercial vacancies in some sectors are down but in some area up. Residential activity is terms of number of units is down slightly over last year. Prices have declined slightly overall but this may be partially due to the assortment of homes selling — more moderate priced homes are selling compared to prior years when there were more units sold at the higher prices. The rental market is very strong and residential vacancy rates are very low. 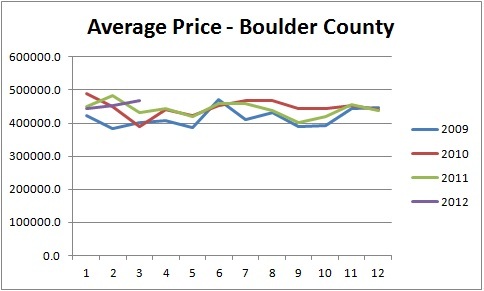 As has always been the case in Boulder County, individuals cities and towns vary from the county as a whole. If you are interested in the price information for your particular area, let us know — email us at info@bernardirealestate.com or give me a call at 303-402-6000. 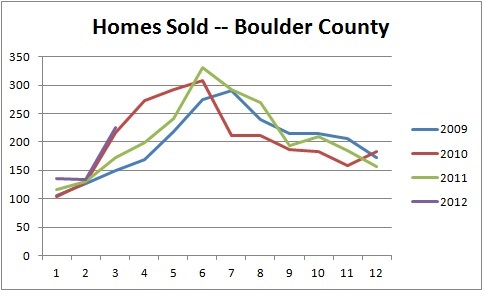 I recently ran across an editorial in the local Boulder paper discussing real estate sales as an economic booster. The writer pointed out that during her process of buying a home, she contributed to the economy by employing a real estate broker to help her with the purchase and a contractor to do a few fix ups after she moved in. By buying a home, she helped the real estate broker and the contractor make a little money. As I thought about the economic impact of selling just one home, I can see much more impact on many more people. The home buying process starts with a homeowner putting their home on the market — usually after doing some sprucing up of the home and perhaps some decluttering. So the local hardware store might have sold a few items, a handyman might have picked up a little work, and maybe a storage facility or local mover might have picked up a new client. A local real estate broker gets a new listing that might turn into a commission. Once the buyer finds the home with their real estate broker (usually a different broker), they hire an inspector and start working on getting their loan. The inspector earns a fee for inspecting the home. The lender generally has at least three people working on a new loan — the loan officer, the loan processor and the underwriter. The title company that will close the transaction has researchers that check on the title and any outstanding liens and a escrow officer or closer that will prepare the paperwork. Chances are that the inspection will find some items that need repair. Repair people will most likely be hired to fix the problems — a handyman, a plumber, an electrician, an HVAC contractor, etc. When the transaction closes, the real estate brokers earn a commission, the title company earns its money for the title insurance and closing the transaction, the lender collects its fees so it can pay its employees. An insurance agent issues a new homeowners policy to the buyer. Now its time for the movers or renting a truck…. As the new home owner settles in, they make a few changes and buy some new items. Now the seller needs a new home and it starts over again…..